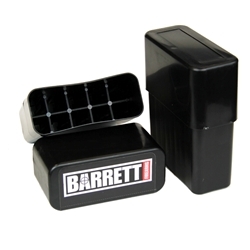 5 Used Slip-Top Ammo Boxes designed to hold up to 10 rounds of .416 Barrett. Box will also fit 10 rounds of .50 BMG, but lid does not close as tight and may feel loose. These durable plastic-constructed ammo boxes have a built-in bullet-tip protection feature for most bullets seated at standard lengths by holding the rounds at the shoulder. Some boxes may have packaging stickers still applied.